The formula is easy. If your website has an appealing design your customers will spend more time and use more of its features. A professional radiance is the key to give your customers an understanding of your services. The crucial role of Social Media in our globalized world is undisputed. The websites that we create are inherently subject to customer friendly Social media integration. All visitors of your site will be able to share your websites content through their preferred Social media channels. Our integrated Content Management System enables you to control, edit and modify your website whenever you want to, wherever you are travelling to, as long as you have an internet connection. A specific technical knowledge is not necessary. Your online appearance is needless if your service or company cannot be found by potential customers. Search Engine Optimization develops your company's website to a level where it is easier for Search Engines to understand and read its information. We build Search Engine friendly websites and develop Search Engine strategies for existing websites. The QR Codes that we develop are of high quality and still affordable for our customers. You want to integrate you companies logo into your QR Code? 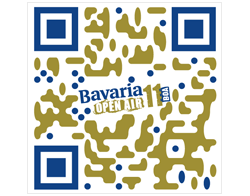 No problem, with our service your customers can see your logo while making use of the QR! A professional and appealing design of your website firstly distinguishes you from your competitors and secondly gives an appropriate impression to your customers. We are specialized in webdesign and webdevelopment and we create unique websites in collaboration with our customers. Check our portfolio for our recent work! Graphic Designers convert all kind of information in a visual form. Translating the customer's wishes into an appealing visual form we are able to create the most appropriate logos, notepapers and business cards. Any other wishes? Let us know and we will do anything it takes to realize your aspirations!